Peoples' Democratic Party (HDP) demonstration in Istanbul, Turkey, on 17 June 2018 for the upcoming general elections.NurPhoto/ Press Association. All rights reserved. The AKP that came to power following the economic crisis of 2002 was forced to call the elections in a panic after dragging the country into a severe economic crisis in the last days of its 16 years in power. Different social strata in society have begun to feel the economic consequences of the government’s security policies and growing oppression, and ambitions for regime change in favor of one-man rule, especially after 2014. As HDP, we see the deepening of crisis of democracy in recent years as the principle cause of the current economic crisis. The AKP-MHP coalition aims to rule the country under the law of a state of emergency and a regime under one-man rule. In recent years the AKP has shattered the social peace. The AKP-MHP coalition aims to rule the country under the law of a state of emergency and a regime under one-man rule. In recent years the AKP has shattered the social peace. The Parliament has been turned into an endorser/notary of the Palace. The judiciary has been turned into an instrument of the Palace. The media have become a propaganda outlet for the regime and academic freedoms were curtailed under the threat of state issued decrees. AKP policies have put on hold the country’s claim to be a democratic society and the deepening of the crisis of democracy has triggered a deep economic crisis. The economic indicators during the state of emergency sufficiently reveal the scale of the economic crisis. Turkey is confronted by high currency rates, high interest rates, high inflation, high unemployment and growing debt. Turkey’s external debt has increased to 453 billion dollars; 53.3% of GDP. The external debt as percentage of GDP was 45.5% before the economic crisis of 2001. It is predicted that the external debt will increase to 57% of GDP by the end of 2018. Steadily increasing since 2011; the external debt during the state of emergency has increased from 48.8% to 53.3%. The sharper increase predicted for the end of 2018 cannot be curbed. Turkey’s economy is in stagnation without increase in production capacity, without significant increase in exports, and with no improvement in per capita income for the past 10 years. An environment of reliability and trust is the foundation-stone for overcoming the economic crisis. 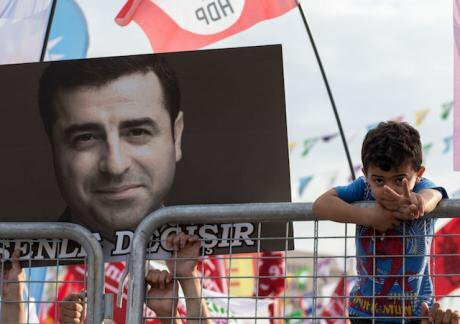 HDP will end the state of emergency and remove the policies that curtail rights and freedoms. We will facilitate the institutions and practices of democracy. We will restore democratic institutions and encourage the practice of democratic principles. We will ensure the independence of the judiciary. We will overcome the crisis in democracy which is the precondition for overcoming the economic crisis. We will overcome the crisis in democracy which is the precondition for overcoming the economic crisis. The aim of our reliable, peaceful and participatory economic program is to ensure that people can participate in the decision-making processes and to strengthen the influence of the workers over relations of production that are compatible with and responsive to our social needs and the ecology. We will increase the income of most vulnerable groups in society by bringing a halt to a corruption economy that has been only benefiting the supporters of the AKP government. We will fund our economic policy by equitable tax policies and avoiding waste and corruption in public expenditures. In this way, we will ensure fair distribution by increasing the income of 60 million citizens. 28.6 million citizens who are below the poverty line will benefit from this Fair Distribution Program. Farmers, minimum wage employers, the unemployed, workers, civil servants, and retirees will be able to breathe thanks to the Fair Distribution Program. We will provide jobs and employment guaranteeing human dignity under the Labour Rights Program. We will support the investment and employment by the KOBI (Small and Medium Sized Enterprises) Supporting Program instead of rent-seeking capital. We will reduce the cost of the productive farmers and raise the value of their production through the Farmer and Agriculture Support Program. We will protect small business owners through the Craftsman Support Program against unfair competition. 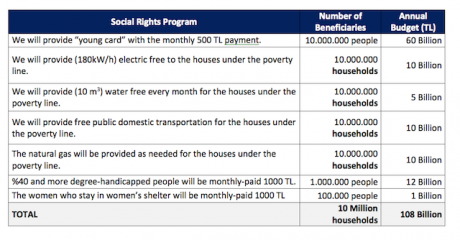 We will implement the Social Rights Program for 10 million households which are below the poverty line, that is under 6.000 TL annual income. We will provide sufficient and free public service for all citizens. Retirees currently have to work due to insufficient income. The number of working retirees will reduce thanks to raising the retirement pension. Young people will take their place in schools and in general employment. We will open kindergartens in all quarters allowing women to participate in social life and employment. We will open kindergartens in all quarters allowing women to participate in social life and employment. Households subject to the Social Rights Program will be fractionally shifted over the poverty line. We will struggle against the discourse on trivializing the labour of handicapped people. We will promote the employment of handicapped people. Employment quotas will be filled in both public and private sectors. 50,000 handicapped people will be employed by the public sector in the first year of the HDP’s ruling period. 5 million citizens’ consumer credit and credit card debts have been rising day by day. 5 million citizens cannot cover their debt installments. The bank debts interest, up to 50.000 TL will be deleted for workers, small business owners, civil servants, retirees, the unemployed and the people who live under the poverty line. Principal repayment will be re-constructed as long-term and zero-interest. Enforcements for debt will be frozen. The debts of citizens will be ended by the Free Distribution Program that will ensure citizens a rising income and a debtless life. Fair taxation will be the focal point for the HDP’s Economic Program instead of borrowing. We will create sufficient financial resources for the Fair Distribution Program through fair taxation, implementing democracy in budgeting and preventing the waste of the public budget. We will effect reform for the institutions and income tax system. We will develop a taxation system that is sensitive to where wealth resides and focused on reducing urban profiteering. Budget rights will be democratically implemented. We will end the AKP’s waste economy. We will create new financial sources for investment, employment and public services in this manner. Politics means making choices. We the HDP, have made our choices in favor of the poor, labor, peace, women and nature. We invite the voters of Turkey to choose HDP’s pro-labor, environmentalist, anti-crisis, fruitful and fair program instead of the AKP’s pro-crisis, unfair, anti-labor and anti-environmentalist politics.